Hello everyone! A few years back I created some fantasy figures under the title The Quest for Kimel Drago. After Hurricane Irma and a meeting with a toy broker, I placed the entire project on the shelf. Recently I came up with the idea of creating a polymer clay tutorial website which includes most of what I’ve done. My goal is simply to get more people into polymer clay sculpture and away from all the digital gadgets, at least for a few hours. You don’t need experience, just give it a shot an see where it takes you. Before the end of my last run, I believe it was the spring of 2016, I created an old school tribute to Beastman which is one of my best works. Enjoy and thanks to the owners of this site for having me. 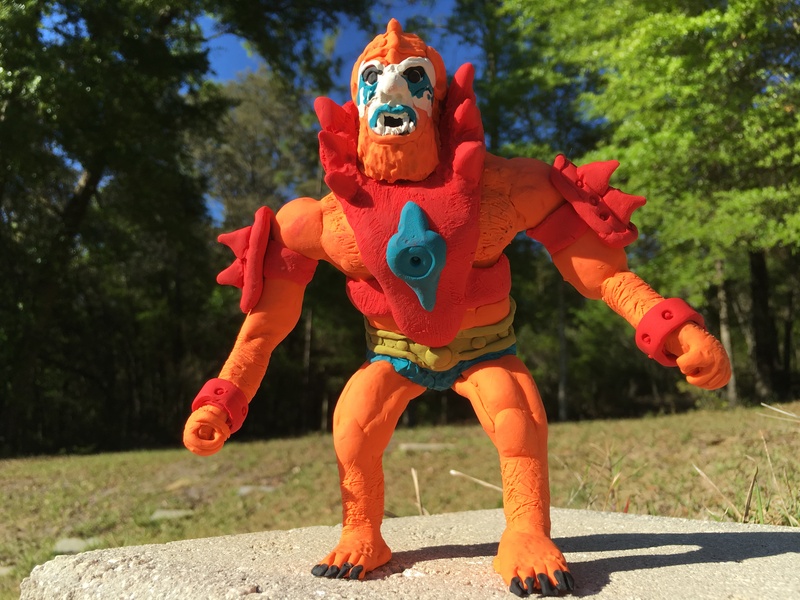 This polymer clay Beastman looks short. I think you should make his legs a bit longer, joe113. Thanks for posting my figure on the thread, that makes it easier than people having to click on the link. Thanks also for your comment and suggestion but I actually made the legs short on purpose. Do you remember the first line of the original figures? That’s what I was going for. Beastman and Stratos, have (the same) shorter legs than the Skeletor and He-Man legs. Actually, the original Trap Jaw also has smaller legs only he has boots and were from a different prototype than Stratos and Beastman. Legs were reused on several characters only they were different colors which saved a lot of money. I’m sure the modern versions of Beastman have longer legs, I’ve seen at least two of them. I’d like to make more Maters of the Universe characters, they were an influence on me growing up although the cartoon took a much different direction than the mini-comics or even the DC comics. I understand they had to water it down, but I’ll never forget coming home from school that day excited to see the first He-Man cartoon and being introduced to Prince Adam, Cringer, Orko, and Man At Arms with a mustache. Anyway, I hesitate to make more of the Maters of the Universe figures because there are not many places to show them. I’m afraid to post them on my own website but know it’s okay for a site like this. Isn’t this site official? 71SDHLbbALL._SY355_.jpg This is the original old school Beastman from my generation and what I aimed for. As you can see, the arms are actually a little longer than the legs. I think the original Beastman was based on a simian to some extent. Also, check out the unmasked part of the face of the original Stratos which is also simian in appearance. It makes sense that Stratos has longer arms than legs because he flies with his arms.